The episode opens with a scared-looking college kid, a bright light shining in his face and a voice that sounds like Darth Vader. I was so waiting for “Luke, I am your father.” We knew from the promos that the COTW centred on the murder of a college professor so this little opening scene had to be about discovering the body. It turns out to be a fraternity initiation stunt. The whole fraternity thing is kind of fascinating to me because Australian universities don’t work like that at all. Anyway, the kid has to sing a Backstreet Boys’ song, which he does very badly, and then drink 100 shots of beer in under 100 minutes. Just so you know, for most Australian students that would be a cinch! Anyway, during the beer initiation stunt, Backstreet Boy discovers a body in a bath of acid (well, it is a chemistry lab!). Oh, gross. As we cut to the opening credits, I imagine Max will be having a field day with this week’s victim. 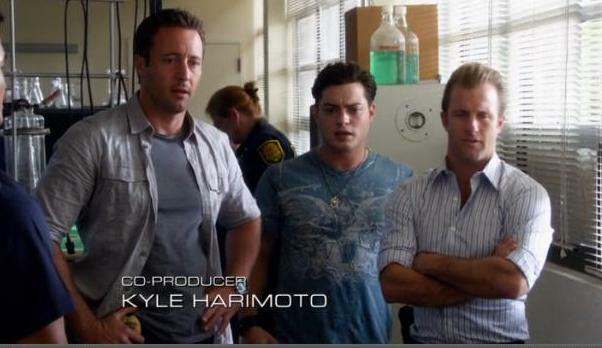 But, alas, when we return from the credits we deviate from the COTW to find out that Kono has to watch over Sang Min, who has been returned to Hawaii to testify at a federal trial in return for a sentence reduction. 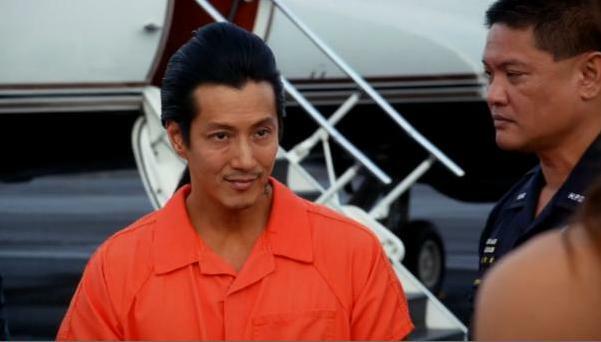 I know Sang Min has done some very, very bad things, but I kinda like him! OK, so we already know who the victim is, Professor Cutler. And we know there are three possible perpetrators: boss Patrick Roth, Cutler’s teaching assistant, and a male student. Now it’s a matter of determining who the killer was – interesting idea but it does put a whole different spin on the episode when you actually sit down to watch it. Anyway, McG and Danny initially think the murder was a robbery gone wrong as Cutler was hit on the head then put in the acid bath and there is some lab equipment missing. But then Chin puts the kybosh on that idea as he discovers that the stolen equipment was recovered (so it’s a murder staged to look like a robbery) and the lab door was broken from the inside. Chin also tells the boys that over 300 students and faculty have access to the lab. Hey, that’s a long list of suspects! But we’ve only got three to choose from – so it’s not really 300 after all, is it? The first person McG and Danny interview is Patrick Roth, Cutler’s boss AKA Door Number 1. Meanwhile, Chin talks to Cutler’s teaching assistant, Door Number 2, who has a beef with the professor over having to do more than his fair share of teaching while Cutler focuses on his research. Roth offers up another potential suspect in a female student he observed leaving Cutler’s office in tears. Now we know she has to be a true red herring as Door Number 3 is a male student. Since, I’m not a beer drinker, 100 shot glasses in 100 minutes seem like alcohol poison case, or hazing. I McNerded! It works out to about 4.5 litres, or roughly 8 pints, or around 16 units of alcohol. It’s a lot to drink in an hour and half (ish). I feel a bit queasy just thinking about it. I’d be sloshed after 2-3 probably. Trying to feel up McG as he strutted around the lab grabbing his batch and hitching his pants….oh wait, I’d probably do that anyway. Nevermind. I love his batch….he was at the head of the line when they were handing out batches. OK, so when I say most Australians would do the beer thing no worries, I don’t include myself in this as (a) I don’t drink beer and (b) even if I did, I’d be under the table after one or two #onepotscreamer. I don’t know how the voting was conducted in the US but in (western) Canada you could only vote through twitter. Not having an account, I just had to sit back and see what ending was picked for me. I was slightly annoyed but as it turned out, the killer that was chosen was the same one I yelled out at my TV when I realized I couldn’t vote!! First, hey neighbor and second, WHAT??!!!! Why was I not aware of this? I was watching global but I thought they said that votes could only be cast through twitter..damn…I guess I should pay closer attention to other things besides the pretty!!! Over here in eastern Canada I twitter voted… hey, fellow Canucks! We could vote twitter or online at Fucbs.com. (Ok I made up part of that address for Ess). Here in the states. I didn’t vote but I picked someone and ended up picking the same as the east coast.. They actually really started cracking down on hazing in the states through the efforts of Eileen Stevens, whose son Chuck was killed from alcohol poisoning during frat hazing. They are/were from my hometown and over 25 years later she still lecturers at universities throughout the states against hazing, even made a Lifetime movie out of the story. The year my brother was pledge master for his frat he was also on the greek counsel and got her to speak at the school (planned that while spending his nights doing exactly what she was lecturing against….bad boy). McNerd Out.